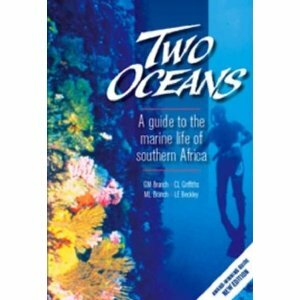 Two Oceans is one of the better known guides to South African marine life, and rightly so. Tony is on his second copy – the first is so dog-eared that the covers have fallen off and the spine has split in multiple places. That’s the sign of a much-loved and well-used book! It is extremely comprehensive and illustrated with photographs of the creatures and plants in their natural habitats, which is how you’d see them as a diver. 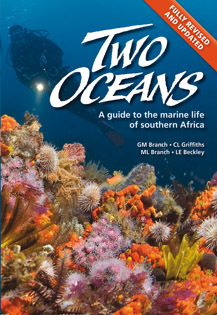 I’ve used the book after dives, but also as part of the volunteer training course I’m doing at the Two Oceans Aquarium, to identify sea plants and animals in rock pools and in the aquarium exhibits. It’s useful for the whole family, even if you’re not all divers, because it covers shore creatures as well as those found only at depth. The book has been through several editions. The latest one (see the cover below) is greatly expanded, with more user-friendly contents pages (it’s arranged a lot like bird books, with colour-coded pages). You can buy the book here if you’re in South Africa. Otherwise go here.